This article is focused at the complete novice. If you’re already familiar with cricket, you’ll notice that I’ve greatly simplified a number of things for the sake of brevity. In the past year, I have become a fan of the sport of cricket, and specifically of New Zealand’s national team. I’m a random guy in the middle of Iowa, so this seems a bit odd to most people – but I have my reasons. I work with a lot of folks from India – some who are based in the United States and other who are based in India. Cricket has a huge following in India. Basically, it dominates the sports culture the way football does in the United States – but to perhaps a greater extent. As a team leader, I have found that a good way to increase the happiness – and thus the productivity – of team members is to show a sincere interest in something they follow. So I decided to learn about cricket. I read through the Wikipedia page and understood some of it. I watched a bit via the WatchESPN app and learned a bit more. Then I repeatedly questioned BTTP editor Darius Austin and learned a ton. Why New Zealand? Well, I didn’t want to be a copycat and pick India. Nor did I want to pick Pakistan, as there’s a lot of bad blood between the two countries. England didn’t seem quite exotic enough. I didn’t want to just pick the dominant team of the moment, so that ruled out Australia. There are only ten countries that play cricket at the highest level, so that left just South Africa, West Indies, Sri Lanka, Bangladesh, Zimbabwe, and New Zealand. From there, it was fairly random. There’s a lot of cricket played during the baseball off-season, so if you want to watch a bat-and-ball sport being played by the best athletes in their field during in the dead of winter, cricket’s a great option. Cricket and baseball are vastly different, but at the very core they both have the skill of putting bat to ball. The “batters” (batsman) attempt to hit the ball without it being caught, score runs by running between “bases” (wickets) before the ball is thrown back in, and avoid having the “pitcher” (bowler) hit the wicket with the ball. You can “foul off” pitches defensively and don’t have to run if you hit the ball weakly. You can score an automatic six runs by hitting the ball over the boundary on the fly (a “six”; the equivalent of a homer) or four runs by hitting it to the boundary on the ground (a “four”; similar to a ground rule double). There are always two hitters on the field, one at each wicket. The bowling teams takes turns bowling at each wicket, bowling six balls (an “over”) at a time before alternating. After the ball is hit, the batsmen run between the wickets. If they score an odd number of runs, they will end up switching spots. If they score an even number of runs, they will end up where they started. Each team gets ten outs per time at bat (an inning). A “batter” (batsman) continues to bat until he is out. This may just take just a minute or two, or it may take a day. A team will score hundreds of runs in a match. There are eleven guys covering a massive circular area (you can hit the ball backward if you want), so there are always massive gaps in some parts of the field. The teams have broad discretion as to where to place the fielders. Bowled – The bowler hits the wicket with the ball, and at least one of the bails (two “thingies” that rest atop three stumps) are knocked off. Caught – The ball is hit in the air and caught before it touches the ground. Pretty much identical to a fly ball in baseball. 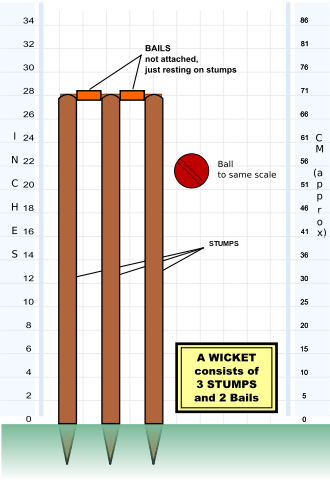 Leg before wicket (referred to as LBW) – The is one of the most complicated aspects of the game. In a nutshell, the batter is out LBW when the ball hits his body (not his bat) but would have otherwise hit the wicket. Sort of interference on the batsman, who can only legally use his bat to keep the ball from hitting the wicket. You can read a much more detailed description on Wikipedia. Run out: A fielder knocks the bails from the wicket while a batsman is “out of his ground” – not at his home base, basically. This can be either a long throw that hits the wicket directly, or a throw to the wicket keeper (the “catcher” position) who will take the ball and knock the bails from the wicket. 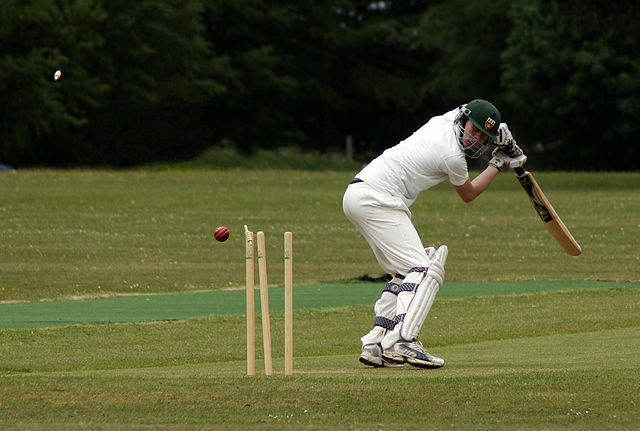 Stumped – The batsman missed the ball and the wicket keeper knocks the bails loose with the ball while the batsman is out of his ground. This generally happens when a batsman cheats forward to get a run at a ball that bounces several feet ahead of the wicket. It’s important to note that if the ball hits the wickets and neither bail is not knocked loose, the batsman is not out. That’s just bad luck for the bowling team. It does happen from time to time. The hitting expectations are reversed from baseball. Whereas a batter usually makes an out in baseball, the batter most often scores runs when he swings his cricket bat – only a few percent of swings result in an out. Outs are incredibly important, and there’s a big celebration when one occurs – the entire team will converge on the guy who made the catch. The better hitters are concentrated in the top and middle of the batting order, so it’s good to get outs early. Getting an out is referred to as “getting a wicket”. This is a wicket. It consists of three vertical stumps and two “bails” that are place atop the stumps. The bails simply rest atop the stumps and are not fastened in place. Cricket Stumps en” by §hep – Own work. Licensed under GFDL via Commons. Pollock to Hussey“. Licensed under CC BY 2.0 via Wikimedia Commons. 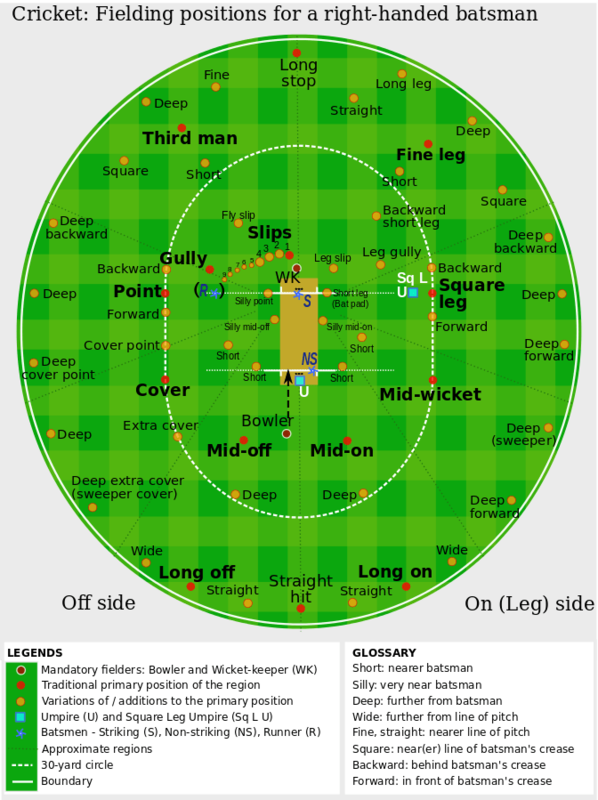 Cricket fielding positions2“. Licensed under CC BY-SA 3.0 via Commons. Note that there are only eleven defensive players, including the bowler. Thus, most of the named positions are unmanned. The defensive team will employ “shifts” based on the tendencies of the batsman. Test – Test is the longest form of cricket. Matches can last for up to five days. Each team has two innings, meaning that each team bats twice and can bat each time until they get out ten times. Five days sounds like a long time, but at times the limit does come into play. You MUST get the other team out in both their innings within the five days. If you have a 500 run lead but run out of time, it’s a draw (tie). For this reason, teams with a big lead will sometimes quit batting when they feel they have enough runs, even if they haven’t made ten outs This is referred to as “declaring”. You will sometimes see teams declare with only 2 or 3 outs. Test is the most conservatively played form, from a batting perspective. The only limit you have as a batsman is the five days, so you can play conservatively – scoring at a low rate, but avoiding an out at all costs. Whether you score 100 runs off 80 balls or 100 runs off 200 balls, it makes very little difference. ODI is a form of “limited overs” cricket, meaning that there’s a limit to how many balls will be bowled. An over is a simply sequence of six balls, and ODI is limited to fifty overs (per team) so the batting team will get 300 balls bowled to them (unless they make ten outs before reaching 300). There are a single innings per team, meaning that each team is allowed ten outs. ODI is more aggressive than test because of this factor. You have a limit to how many balls you will see, so you can’t waste a lot of opportunities. Scoring 200 runs and making ten outs is far better than scoring 175 and making zero outs (whereas in test, you’d be in a much better position scoring 175 runs and making no outs). T20 is another form of limited over cricket. T20 is limited to twenty overs (120 balls) per team, with matches lasting just three hours. T20 is much more aggressive than test or ODI, with much more focus on scoring quickly and less emphasis on avoiding wickets (outs). With the various forms of cricket, there’s a bit of something for everyone. I’ve found myself more drawn to test and ODI than T20 because of the interesting tactical decisions that often need to be made. If you’re looking for something more fast paced, T20 is the game for you. This barely scratches the surface of what cricket is all about (and many true cricket fans would be aghast at how simplified I’ve made this), but it should be enough to get started. I’ve found that the best way to learn is to simply watch a few matches. ESPN features some matches on their WatchESPN app (ESPN3). For a wider variety, a number of national teams and leagues can be found on Willow. Willow is a TV channel that is available on some cable/satellite systems, and is also available as a streaming service ($15/month). Many of the top cricket playing nations are in the southern hemisphere (or the Indian subcontinent), where the best weather for cricket is during baseball’s off-season. England is the notable exception. It may be the dead of winter in the USA, but there’s plenty of great cricket being played.